Giant Cuttlefish and many species of fish and sea creatures abound in the unique marine habitat off the coast of Whyalla in the Spencer Gulf being one of only a handful of inverse estuaries in the world. The annual migration of the Australian Giant Cuttlefish ‘Sepia apama’ is one of the most spectacular natural events in the Australian marine environment. This natural wonder attracts international divers, researchers and journalists to dive and snorkel to experience the aggregation from May to August which is unique in the world to Whyalla. These ‘chameleons of the sea’ are one of the largest species of cuttlefish found, reaching up to 60cm in length and weighing up to 5kg. The migration by these majestic creatures to these waters is for the sole purpose of spawning. Every year between May and August, they come in their tens of thousands to mate and reproduce, in the process creating an amazing spectacle of cunning games, predation, underwater light shows and colourful kaleidoscopic displays. Cuttlefish are intelligent creatures able to change their colour, shape and texture as they move along the seabed to imitate rocks, sand or seaweed. As males are vastly outnumbered (a gender imbalance unique to Whyalla), there is fierce and frenzied competition between males for mating privileges, leading to displays of unusual and spectacular behaviour. Mating takes place with the cuttlefish linking their eight arms and two tentacles for head-to-head contact, with the males slipping their sperm packages into the female’s mouth and fertilising her eggs. The female lays tear-shaped eggs and attaches them to the underside of the rocky ledges and in rock cavities where they hatch three to five months later. It is believed they congregate here in such large numbers as it is the only area in the vicinity with rocky ledges suitable to lay eggs. Commercial fishing almost destroyed this world class phenomenon, therefore the cuttlefish are protected during their breeding season between May and August. There is TOTAL closure on fishing for Cephalopods (including squid, cuttlefish & octopus) in the Point Lowly to Whyalla region (click here to see map). A TOTAL closure on fishing for cuttlefish also extends throughout the top of the Spencer Gulf - North of Arno Bay/Wallaroo until 15 February 2019. 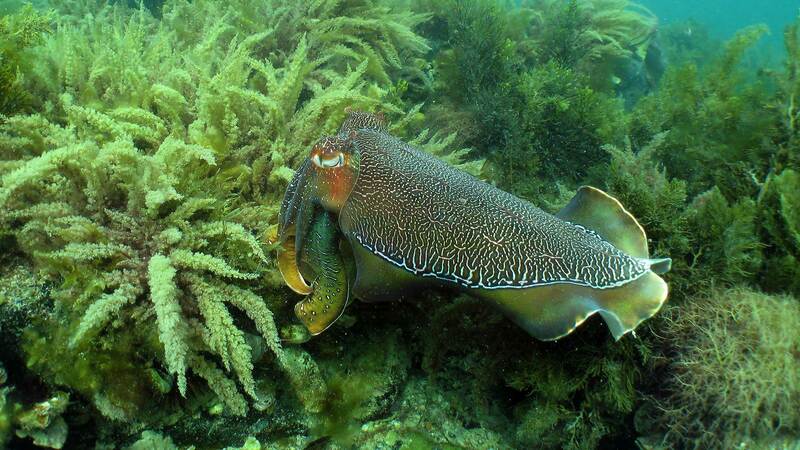 Cuttlefish are colour blind. They have ‘w’ shaped pupils which are thought to allow them to see both behind and in front at the same time. Cuttlefish are not actually a fish. They are a cephalopod (Greek for ‘head-foot’), and their feet, or tentacles actually connect to their head rather than their body. Cuttlefish have blue blood, 3 hearts, 8 arms and 2 feeding tentacles.